See 35PointLowApproachPress for a similar treatment, see also PressingDownOnThe34Point. Dieter: In the Paris 2005 Burzo Motoki game, a similar position came up, but then with a white stone at a. 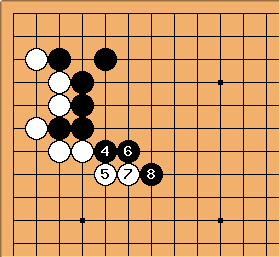 All White's moves are quite natural, but after , she will either lose all corner stones, or lose the marked stone in a ladder (which is assumed to work). Hence, can be considered a hamete. 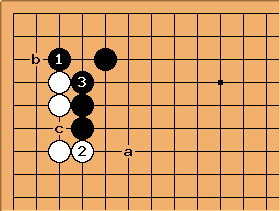 Tapir: Even if this sequence may be inferior for White nobody forces White to play this way. 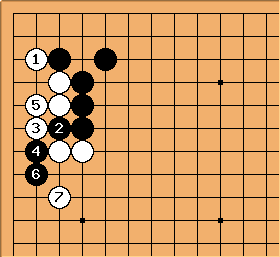 Calling a move hamete assumes there is a refutation which ends bad for the player who played the trick move. With a white pincer stone on the side the attachment at 33 is a (not-so-)well-known family of joseki, the lack of a pincer doesn't turn it to a trick move, although emphasising the corner when the side is still open is pretty uncommon probably just inferior, but the lines of play are identical to the joseki after a pincer. No trick is involved. For many amateurs however it is very hard to resist what they perceive as "bad shape" or an "overplay" that "needs to be punished". Test it in a game, up to dan ranks most players will push to punish. And this urge is not related to the niceties whether there is or isn't a pincer stone present. 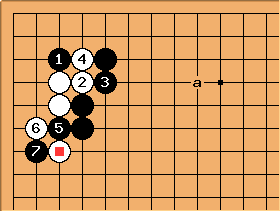 Most will feel the same about the attachment where it is perfectly joseki (with a pincer present). Clearly, even with the ladder potential, Black's outward thickness outweighs White's corner position, which incidentally has some bad potential as well. Note that White can cut at b, but that it will not lead to immediate success and that the ladder potential is sacrificed if she does. The hane at does not work either. IIRC, Ishida recommends , building strength along the left side. Black can now take the corner. I assume White can either take sente or strengthen her position in an effective way. Please review. Anonymous: Not much to add here, except that I think this is a slightly better sequence for Black. 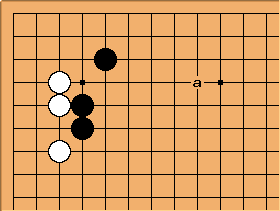 White would probably now prefer a to b, so no need for Black to play there immediately. Plus, this makes a cut at c a possible issue at some point. Just my thoughts, I'm no Ishida... In any case, White (the protagonist of this page) looks fine. Anonymous: Perhaps, but here is just bad. Tapir: isn't bad, it is the professional move, you just can't exploit those cutting points immediately. 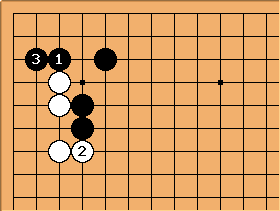 All the cutting points become a burden for White in the pushing battle, at some time White has to go back and defend. After the time has come to defend. Otherwise it will be a desaster for White.